The Great Johnsonstown Flood and worst tornado in the history of the Commonwealth of Pennsylvania both occurred on May 31. My friend Jesse Ferrell has a post on post here. 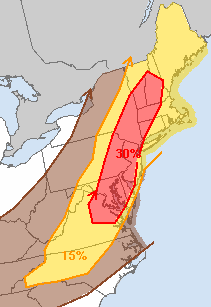 There is a very good chance of severe thunderstorms in BOS, EWR, NYC, PHL, BWI, DCA, IAD, and CLT tomorrow. Keeping in mind that JFK, EWR, PHL, IAD, and CLT are hubs, the effects of these storms could reverberate across the airline system tomorrow even if your flight does not go through those cities. So, I suggest getting to the airport early and be prepared to request a reroute. 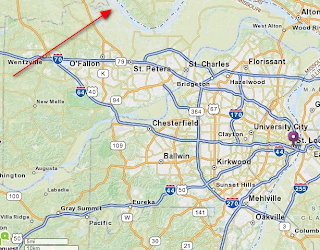 It is more than a month since the Good Friday Tornado in St. Louis. It was a situation where everything went right that evening and no one died or was seriously injured even though it was an F-4 intensity tornado. Here are two articles from the St. Louis Post-Dispatch about the (slow) recovery. 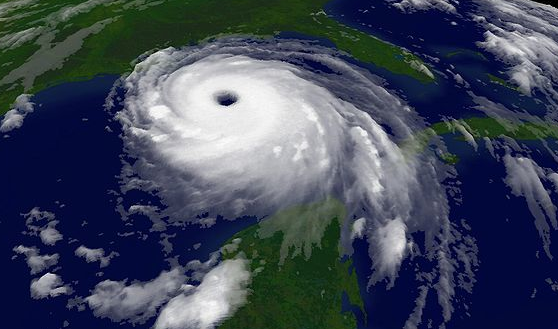 The 2011 hurricane season officially starts today. I ran across this photo from a hurricane hunter flight and wanted to bring it to you. The brave crews of these flights describe the view inside the eyewall as similar to what one would see in a stadium. I believe this photo, from Hurricane Katrina, illustrates it well. You can better picture the crew's perspective while in the eye with this simulated view of Katrina from space using this weather satellite image. 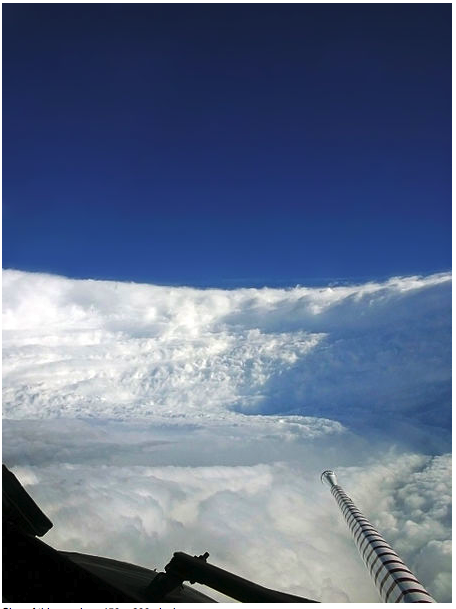 We owe a lot to the hurricane hunters. Without them, our forecasts and warnings would be much less accurate. Thanks to Charles Jaco of KTVI, St. Louis (the station where I worked from 1979-81), for a great interview. I believe you'll really enjoy watching it. 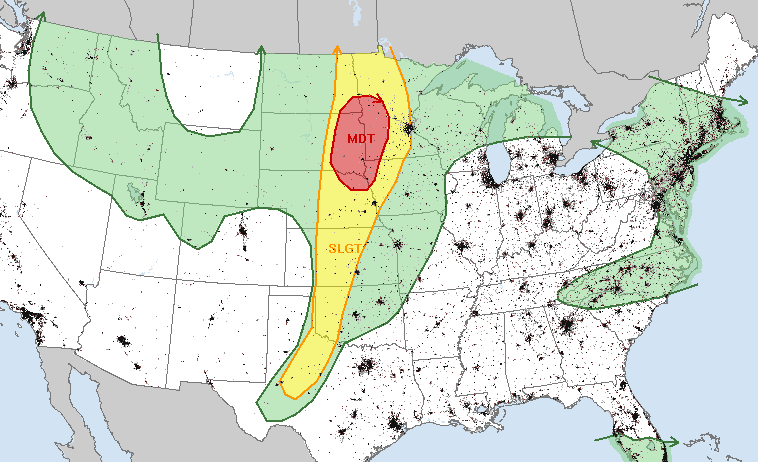 The tornado potential (below) is associated with the moderate risk. 5% is a significant probability for tornadoes and 10% with hatching (which means ≥F-2 tornadoes) is very significant. So, keep up on the weather in these areas today!! Why Shelter in the Lowest Floor? Springfield "News-Leader" photo. Click to enlarge. I've placed arrows on the lowest floors of the apartments. You can see the lowest floors are generally in better shape than the upper floors that are, in some cases, utterly destroyed. The reason is that the winds in a tornado -- and have more destructive power -- a few hundred feet above the ground. A basement is best, but if you don't have one get as low as possible. Dangerous line of thunderstorms with the potential for very damaging winds and small tornadoes at 5:30pm CDT. 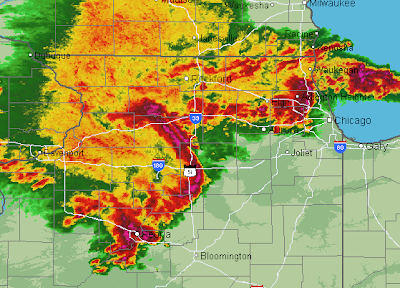 These storms should not affect the completion of the Indy 500. The National Weather Service's Storm Prediction Center has upgraded and enlarged the severe weather outlook for tomorrow. Tornadoes are now expected from the Canadian border to the KS-OK border with damaging winds and large hail the primary threat farther south. The green areas have a lightning threat. 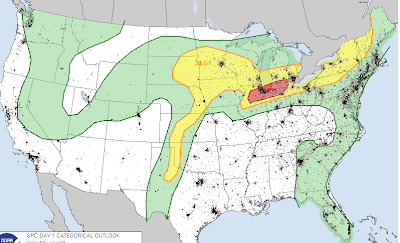 Flying to Chicago This Afternoon? Time for Plan B.
UPDATE: 4:30PM SUNDAY. 430 flights cancelled at O'Hare, remaining flights now average 3 hours late. Average delays at O'Hare are now up to two hours, four minutes and will only grow as the afternoon progresses. If you have a flight scheduled to go through O'Hare or Midway the rest of the day, be proactive. Arrive at your departure airport at least 30 minutes earlier than you ordinary would. See if your airline can reroute you around Chicago. For example, if you are on United and are changing planes in Chicago see if they will reroute you through their Denver or Dulles hubs. Or, put you on a different airline altogether. 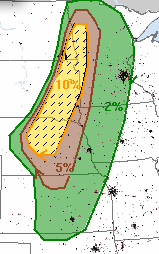 Here is today's thunderstorm outlook valid from now until 7am Central time. The green areas represent a 10% or higher chance of a non-severe thunderstorm -- something to keep in mind if you are going to be outdoors. Yellow is an elevated or slight risk of a severe thunderstorm. 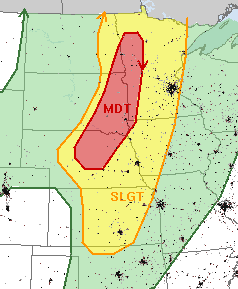 Red is a moderate risk. 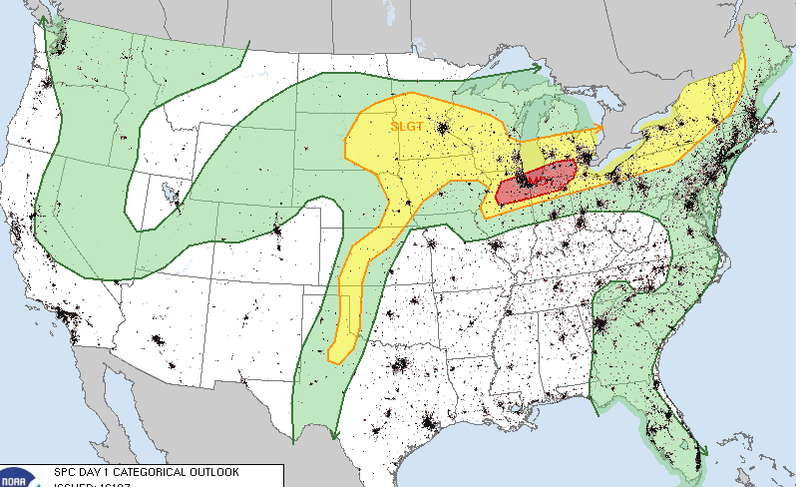 The moderate risk, which includes Chicago, is primarily due to the threat of damaging thunderstorm winds. 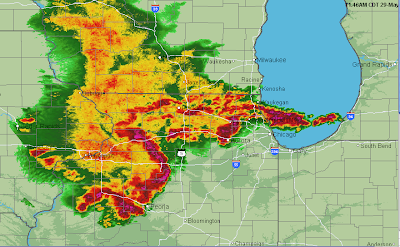 AccuWeather regional radar shows thunderstorms with potential damage winds in northern Illinois near Peoria moving rapidly east. Watch the full episode. See more Impact. Here is a great interview about tornadoes by KPTS TV in Wichita. Cruising at 35,000 feet and nearly four hours into what seemed a routine overnight flight to Paris from Rio de Janeiro, an Air France cockpit crew got a stall warning and responded by doing what even weekend pilots know to avoid: They yanked the nose of the plane up instead of pointing it down to gain essential speed. Air France stands behind pilots of plane that crashed two years ago kiling all 228 people aboard. 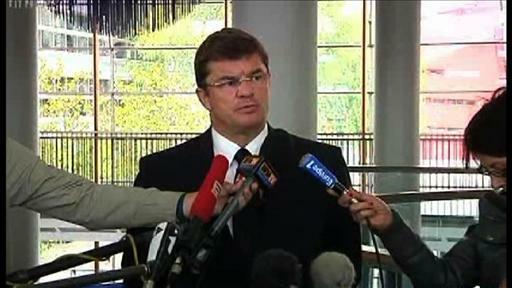 Video courtesy of Reuters. Apparently confused by repeated stall warnings and reacting to wildly fluctuating airspeed indications, pilots of Flight 447 continued to pull back sharply on the controls—contrary to standard procedure—even as the Airbus A330 plummeted toward the Atlantic Ocean, according to information released Friday by French accident investigators. The June 2009 crash took the lives of all 228 on board. "You Never Know What Path the Storm is Going To Take"
This report from KMOV TV aired yesterday illustrates the apparent gap between meteorologists and emergency managers on the topic of selectively warning of the path of tornadoes. Another example of the gap is here. I don't ever wish to sound like I am "picking" on emergency managers. They have a difficult, "darned if you do, darned if you don't" job. That said, it does appear that there is a significant gap between meteorologists and emergency managers with regard to the the NWS "storm-based" (or path-based) warnings that became official more than five years ago. Mr. Mark Diedrich, of St. Louis County Emergency Management, says in the report, "You never know what path the storm is going to take." That is simply not true. 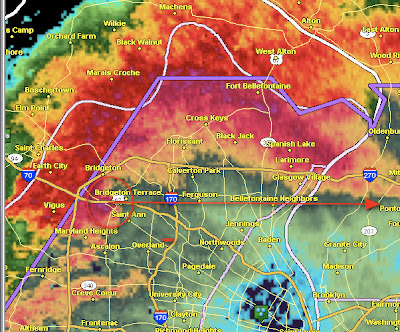 To illustrate, below is the storm-based warning (purple) issued by the National Weather Service on the St. Louis Good Friday Tornado when it was approaching Lambert Airport (an earlier warning covered the tornado prior to this time). 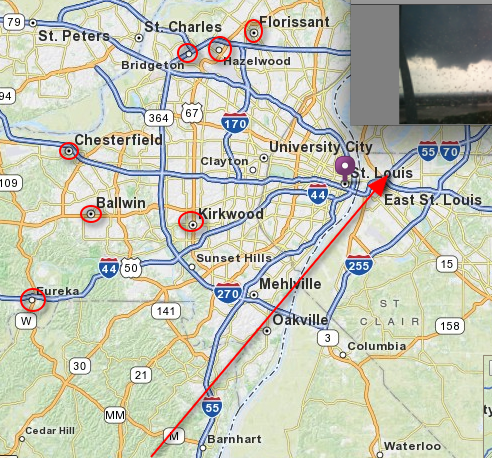 I have added the location of the tornado at the time of the image (circled) and the path it actually took (arrow). purple in color along I-70. 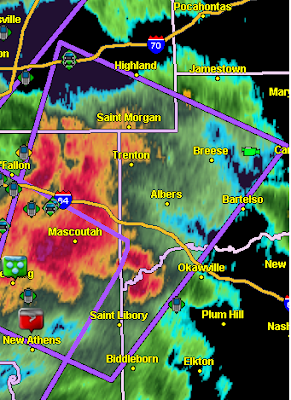 Note that the polygon is far, far wider than the path of the tornado itself so that a margin of safety is built in. 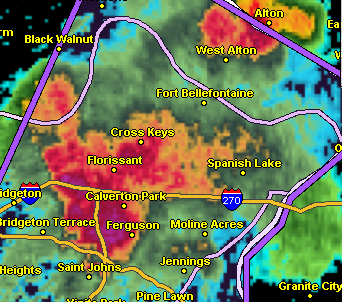 Even with sounding the siren only in the areas covered by the polygon the sirens would be sounding far to the south in Clayton and downtown St. Louis. I don't mind that because it is part of the "margin of safety" built-in by the National Weather Service. But to sound the sirens every time any part of a county (or adjacent county!) is threatened is unnecessary and breeds complacency. Storm chaser and meteorologist Jon Davies, from his blog here. Guest, an eye-witness I spoke to said people at a driving range kept right on hitting golf balls even as the tornado sirens were blaring. Stan Finger, Wichita Eagle web chat, Monday. a CNN Wire report quoted Alexa Wattelet, in Joplin at the time the storm hit, as saying that "the sirens always go off, so no one thought anything of it." Joplin resident Rick Morgan thought about it before taking cover. “They go off, and it’s like, you know, tornado never comes, it seems like,” he told CNN on Monday. What might cause this seemingly irrational behavior? I have a theory: We have sounded the sirens so often that people have come to ignore them. I've written two posts in the last six days on this topic. Go here and here to read them. 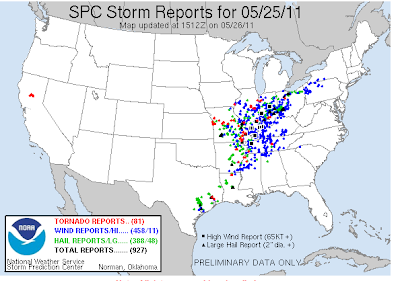 From 1957 to 2005, the National Weather Service issued tornado warnings by whole counties. This was appropriate because our skill at locating and tracking tornadoes was not very good. So, alerting relatively large areas made sense. While visiting St. Louis earlier this week, I learned that they have a policy of sounding tornado sirens not only in all of St. Louis County when a warning is issued for any part of the county, but sounding the tornado sirens in all of St. Louis County when a tornado warning issued for an adjacent county! nearly 50 miles away from the tornado! On Wednesday, a tornado warning was issued by the National Weather Service for a funnel cloud that followed the path indicated by the arrow. Photo is the actual funnel (located at the arrowhead) as viewed from our hotel (purple pin). The NWS issued an accurate warning for the path of the storm. Yet, tornado sirens went off over all of St. Louis County. I've circled some of the cities in which the sirens were sounded (there were many more) that were not threatened at any time. Defending the policy, the Acting Director of St. Louis County Emergency Management, Bill Roach, says the sirens mean one thing. Roach says the current policy saves lives, because tornados can change directions, and trying to guess where to selectively warn people could lead to deaths. Trying to guess? This isn't 1964. Meteorologists know the direction of movement of these storms. Plus, the National Weather Service adds a margin of safety. 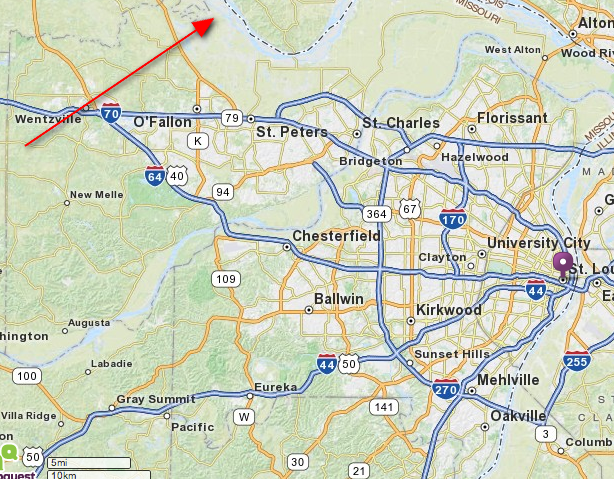 There is absolutely no scenario where (to pick one example) Ballwin was at risk from that storm. Saves lives? I believe this gross overwarning risks doing the opposite. When you sound the sirens time and time again in areas where there is no threat, people stop paying attention. I saw it in Lawrence and Overland Park Saturday and again in St. Louis on Wednesday. It is long past time to rethink countywide and multi-county tornado siren activations. Sirens should only be activated in areas where there is a genuine threat. I posted these photos last night. I now have a first-hand account of conditions inside the hospital when the tornado struck. So, I'm bumping this back up to the top along with some additional comments. The death toll as of Friday evening is 132. Nine hundred were injured and more than 100 still missing. Things were no better outside of the ED. I saw a man crushed under a large SUV, still alive, begging for help; another one was dead, impaled by a street sign through his chest. Wounded people were walking, staggering, all over, dazed and shocked. All around us was chaos, reminding me of scenes in a war movie, or newsreels from bombings in Bagdad. These photos were taken inside St. John's Hospital in Joplin after it was struck by the F-5 tornado. They are used with permission. The first photo is correctly oriented and demonstrates the calling card of an F-5 tornado: Objects embedded in concrete stucco [see comments below]. The objects in the background don't surprise me, I've observed similar "embeds" in the past. The chair in the foreground stunned me. 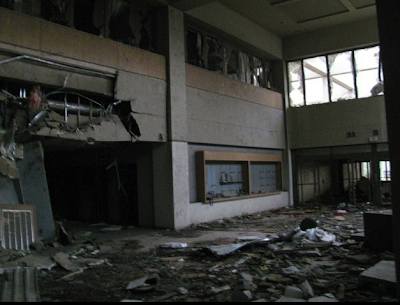 The other photos demonstrate the hellish conditions inside as the hospital took a direct hit from the tornado. Main lobby. Even the second floor windows are blown out. 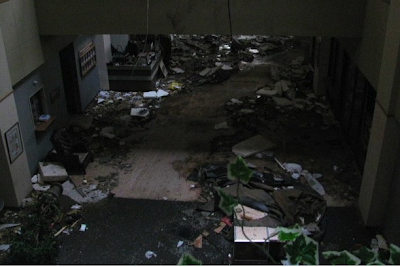 The debris were blown through the hospital at high speed. The situation in Joplin is just horrific. 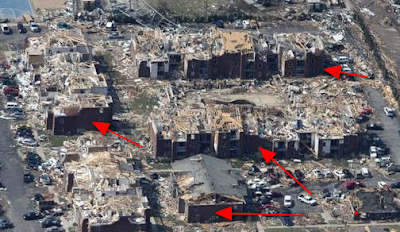 I'm posting these photos to demonstrate the power of an F-5 tornado and why it is absolutely essential to be in underground shelter (if at all possible) when a tornado warning is issued. The death toll in Joplin has risen to 126. This surpasses the 1981 Hyatt Regency walkway collapse in Kansas City in that killed 114 in Missouri disaster history. It is the worst single tornado death toll since the Woodward, OK tornado of 1947 that killed 181. For comparison, the worst single tornado death toll in U.S. history was the Tri-State Tornado of March 18, 1925, that affected Missouri-Illinois-Indiana. That tornado killed 689 [thanks, Keith]. Had a wonderful time in St. Louis. I'm especially appreciative to the huge crowd at the Rotary Club meeting yesterday. That's me at upper left. I like to move around when I do Q&A. 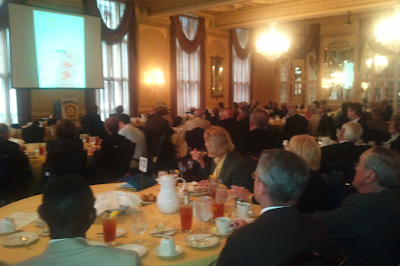 My talk was about the amazing success brought by the advance warnings of the St. Louis tornado. I'm next to the projector so everyone could see the images on the screen. 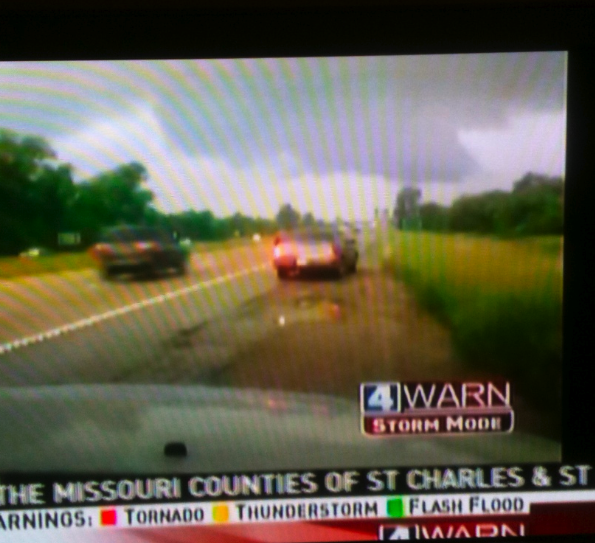 I was interviewed by my old station, KTVI Channel 2. It is scheduled to air 8:30 Sunday morning. I also taped "Extra Edition" for KMOV TV which is scheduled to air at 6am Saturday morning. Both the KTVI and KMOV programs will be put on the web and I'll link to them when they become available. Finally, no trip to St. Louis would be complete without a trip to my favorite dessert stand on the original Route 66 -- Ted Drewe's Frozen Custard. 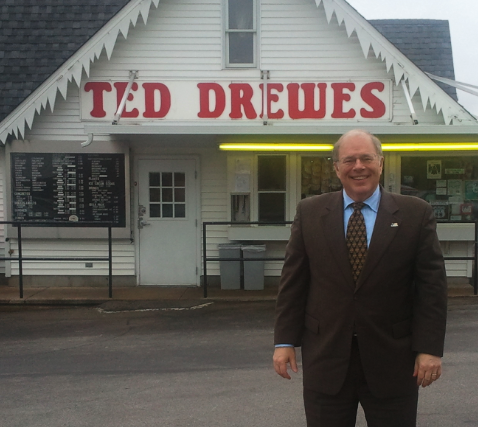 Dinner at Maggiano's, Dessert at Ted Drewes. 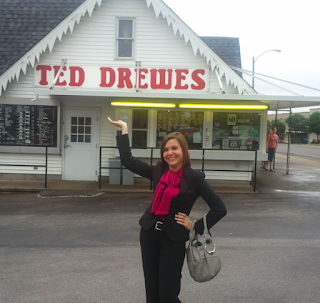 Natalie Huenergardt proclaimed the frozen custard, "addictive." 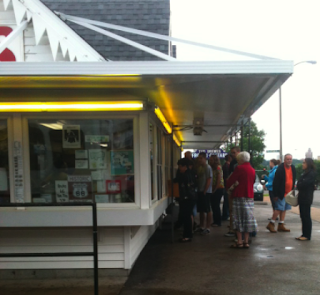 It is the most amazing place: 55° with a light drizzle and yet people are lined up for the delicious treat. Two buses pulled in right after I took this picture. If you visit St. Louis you have to visit Ted's. You don't need directions from me, just ask any St. Louisian. Q: How bad has this year’s tornado season been, relative to other years? A: Extraordinarily bad, even by historical standards. The death toll, now at more than 480, is the highest since 1953, when an outbreak of twisters across the Midwest and the Northeast claimed 519 lives. The high death toll this year is all the more remarkable considering that early warning systems are in place throughout tornado country, made possible by the advent of Doppler radar. Many tornado experts believed that the advances in technology had greatly diminished the risk of mass tornado fatalities. “We never thought there’d be another year of deaths like this, with all our warning systems,” said Thomas P. Grazulis, a tornado historian. 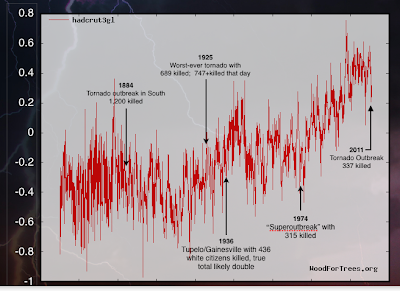 Since 1875, there have been just 15 years with more than 360 tornado deaths, and none since 1975. The single deadliest tornado year in the United States was 1925, with 794 fatalities. This year now ranks eighth on the list of deadliest tornado years. Q: How long does it take for a town to recover from a tornado, in comparison with a hurricane or other type of natural disaster? A: As destructive as tornadoes can be, the damage they cause tends to be confined to a swath within a town or in the countryside, while hurricanes, floods and earthquakes can affect a wide region. The water and shifting soils that accompany such events often cause additional disruption. Experts say there is no simple timetable for recovery. But in general, the recovery from a tornado is quicker than from more multifaceted disasters. “With something that is more localized, in effect, it’s easier to get resources up to the problem,” said Joseph Booth, executive director of the Stephenson Disaster Management Institute at Louisiana State University. Robert Kates, a co-author of “Reconstruction Following Disaster,” said natural disasters had an arc of recovery that fell into recognizable patterns. “There’s the emergency, in which you’re doing search and rescue and you’re housing people in evacuated spots” and just trying to get by, Mr. Kates said. “The second phase is where you repair everything that’s repairable,” from patching streets to restoring water and gas lines. The third stage is reconstruction. A: Probably not. 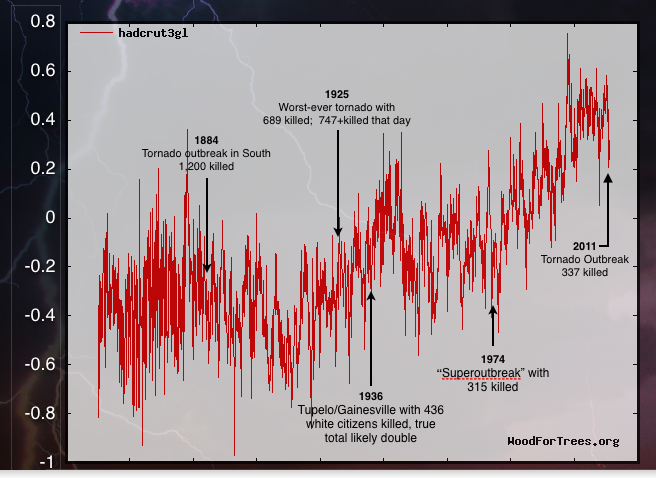 Over all, the number of violent tornadoes has been declining in the United States, even as temperatures have increased, making it likely that this year’s twister outbreak is simply a remarkable and terrifying — but natural — event. Climate science has long predicted that global warming will cause more weather extremes, however, and statistics suggest that this has started to happen. In most areas of the world where good weather data is available, instances of heavy precipitation are rising, often leading to flash flooding. And the same thing is true of heat waves; in the United States, new high-temperature records for a given date now occur twice as often as record lows. Q: How do tornadoes get their shape? Q: Why does the sky sometimes look green when a tornado strikes? Q: How far can an object picked up by a tornado travel? A: Tornadoes have tipped over trains and sucked up cows, but the objects that travel farthest are, not surprisingly, small and light. In 1995, researchers at the University of Oklahoma wanted to study the pattern of debris carried long distances by tornadoes. So after a tornado, they asked people to send them identifiable objects, for example, canceled checks, which helpfully include the name and address of the check writer, making it easy to figure out how far the check has traveled. In five years, more than 1,000 objects were collected, said John T. Snow, dean of the university’s College of Atmospheric and Geographic Sciences, who led the tornado debris project. Among the odder ones was a man’s bowling jacket. “It had his name stenciled on the back of it and the name of the bowling alley,” Dr. Snow said. Q: How well can meteorologists predict the path of a tornado? A: John Ferree, a researcher with the National Severe Storms Laboratory in Norman, Okla., said forecasters typically issued a warning for about three of every four tornadoes, and rarely missed a strong tornado like the one that hit Joplin. But predicting the precise touchdown point and path is difficult. Meteorologists can see from radar where the center of the wind circulation is, but that is a mile up in the air, and the path to the ground may be slanted. Normally, forecasters can place a tornado within about five miles of its touchdown point, Mr. Ferree said. Q: What is the risk of being killed by a tornado in the United States? A: Nationwide, the risk is 1 in 5 million, according to Dr. Harold E. Brooks, a research meteorologist at the National Severe Storms Laboratory, part of the National Oceanic and Atmospheric Administration. Before 1925, the death rate was nine times as high. After tornadoes that year killed 695 people in Missouri, Illinois and Indiana, mass communication improved, public awareness increased and builders began making stronger houses. As a result, Dr. Brooks said, tornado deaths declined for decades. But the decline slowed in the 1990s because more and more people began living in mobile homes, which are tossed about by the high winds. People who live in trailers or mobile homes are 15 times as likely as those in permanent housing to be killed by tornadoes. Dr. Brooks said that this year, the rate of tornado deaths among mobile-home residents might reach 50 per 5 million. Q: After Hurricane Katrina, there were hundreds of homeless dogs and cats. What has happened to people’s pets in Joplin? A: About 70 animals — dogs, cats and some parakeets and cockatiels — have been taken to the Animal Adoption and Resource Center in Joplin so far, said Lisa Buehler, the manager there. But the shelter is expecting many more to arrive in coming days. Q: Could lives and property have been saved if residents in the areas struck by tornadoes had opened a window or two in their houses? And should drivers have stayed in their cars or sought safety under highway overpasses? A: The idea that opening windows can spare a building from damage from tornadoes is a common misconception. By equalizing air pressure with the low-pressure tornado outside, the thinking goes, the building will not explode from within as a result of the pressure difference. But experts say that opening windows is useless; internal forces do not damage houses — powerful winds and, most especially, the debris that those winds throw around like missiles, damage and destroy houses from outside. I want to say thank you to the Barnes & Noble at Ladue Crossing for hosting this evening's book signing. In addition to the books we sold during the event, several happy readers came in to have me sign their already-purchased books. I'm always happy to do that and appreciated their kind words. Authors love to hear that people enjoyed their book! They asked me to sign the remaining books. 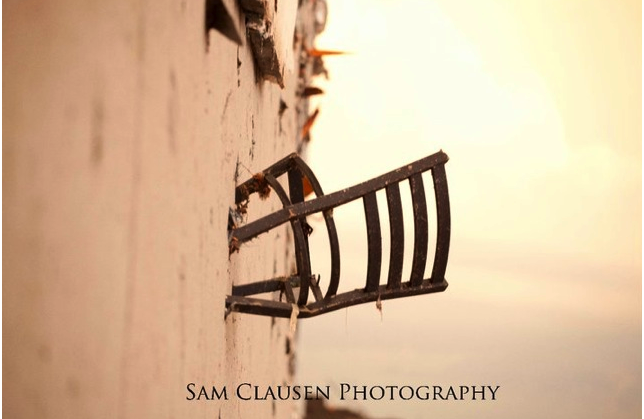 So, if you would like to get an autographed copy, please visit their store. 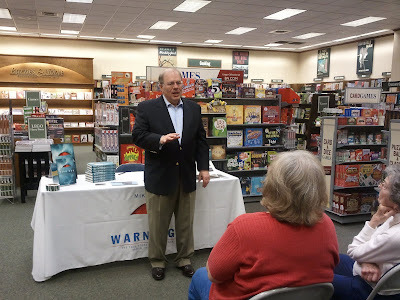 I'll be making a brief presentation and signing books at the Barnes & Noble at Ladue Crossing this evening from 6:30 to 8:00pm. Here is a story about the signing from the St. Louis Beacon. 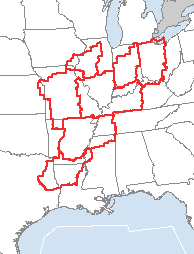 Tornado watches are in red, severe thunderstorm in blue. 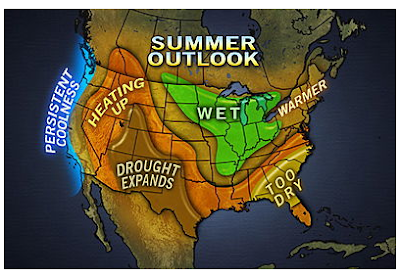 In the two 5% areas, I would keep up on the weather today, but the threat is greatly reduced from the last three days. I just would like to say "thank you" to the Learjet/Bombardier Management Association for having me as their speaker Tuesday evening. If you would like to book me for your group, please send an email to: speeches@mac.com . How Much (Tornado) Warning is Enough? In recent years, the emphasis in meteorology has been to gain "lead time" for tornado warnings (i.e., issue the warnings sooner relative to the storm's arrival time). The U.S. average now is around 14 minutes. In the devastating Alabama tornadoes on April 27th, the average lead time was 24 minutes. In Joplin, the lead time was 19 minutes. It is an important question because there will always be a tradeoff between accuracy and lead time, i.e., tornado warnings with one hour of lead time (given today's science) will be inaccurate most of the time whereas 1 minute lead time (see below) will be extremely accurate. While this represents an unscientific poll of about 800 people (voting still going on at the link above), it does suggest that 14 minutes is adequate. I believe that the bigger problem is false alarms and would rather see meteorology focus on that issue rather than extending lead time further. Global Warming Responsible for These Tornadoes? Mike Smith Enterprises chart by Karen Ryno. Click to enlarge. As you can see, exceptional tornadoes have occurred with temperatures cooler than today's. Note: When researching my book, Warnings, I learned that before the 1950's, African Americans killed the South in natural disasters were not counted in the statistics. The reason for so many tornado deaths this year is because, by coincidence, the tornadoes have struck densely populated areas. 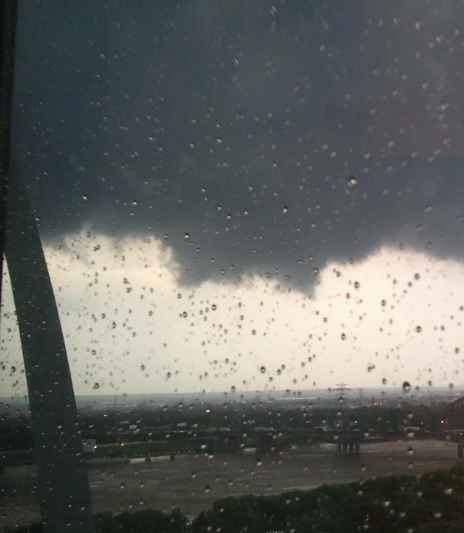 Photo of the funnel cloud over East St. Louis this afternoon taken by Mike Smith Enterprises marketing assistant Natalie Huenergardt. The south leg of the Gateway Arch is visible at lower left. If you wish to see what the radar looked like at this time, click here. If you wish to hear the interview with me during the second half hour of "St. Louis on the Air," click here. I wish to thank Don Marsh for being a great interviewer and to Libby and Mary for their assistance. Reminder: The St. Louis book signing will be at the Barnes & Noble at Ladue Crossing tomorrow, Thursday, from 6:30 to 8pm. I can't live blog any more for now...I have business commitments I have to attend to. I'll try to post a little more later. Conditions are right for large, damaging tornadoes. See posting below. 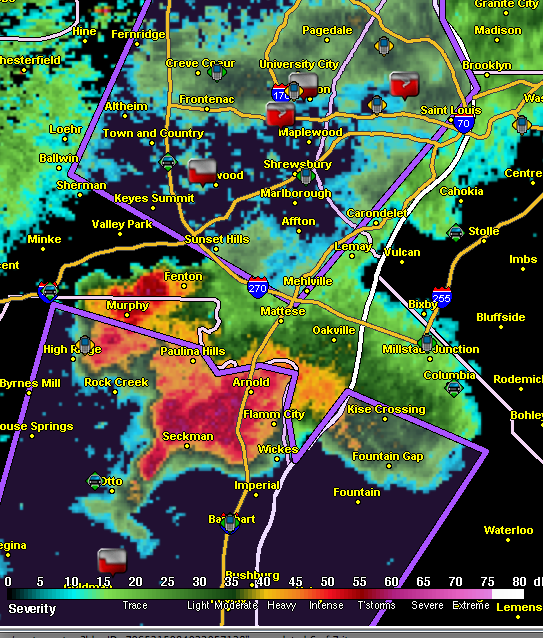 New tornado warning for the storm near Scott AFB, IL Storm moving NNE. UPDATE: Damage reported in Freeburg, IL at 5:28pm. I've circled the area where large hail is falling in St. Louis. 4.2" hail report. Two hook echoes in Illinois indicated by arrows. 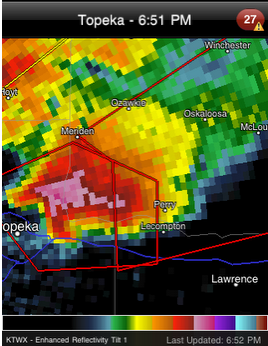 Hook = tornado signature. 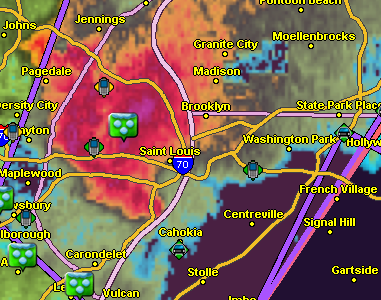 4:37pm, Hailing downtown STL, 2.5" hail mid-City. Hook just south of downtown STL moving NNE rotation near the River. 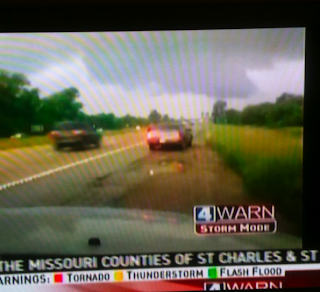 From KMOV TV, image of rotating wall cloud at 4:22pm. 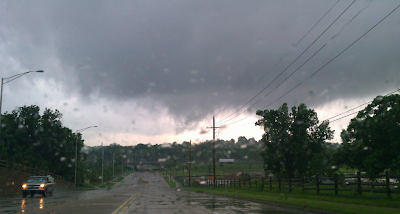 A rotating wall cloud is often a precursor to a tornado. 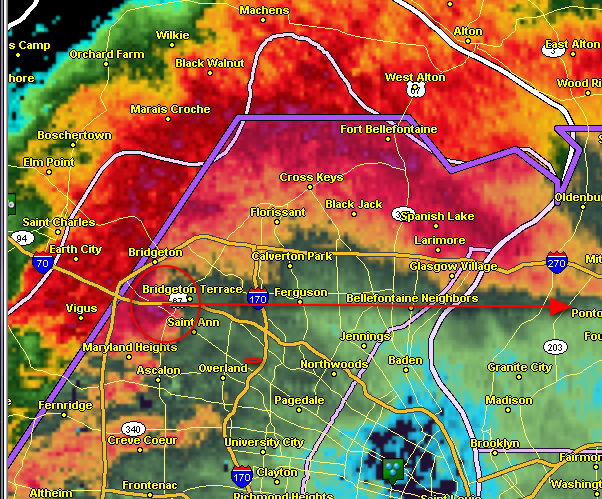 Tornado near I-55 and I-270 moving NNE and may move across the City of St. Louis and adjacent St. Louis County. 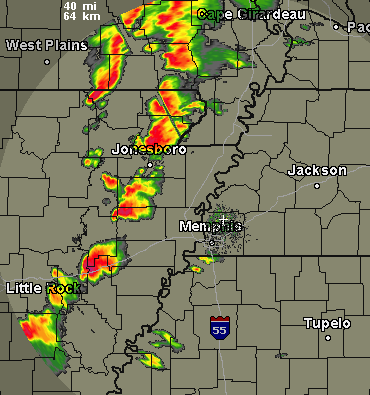 Radar from 4:14pm. 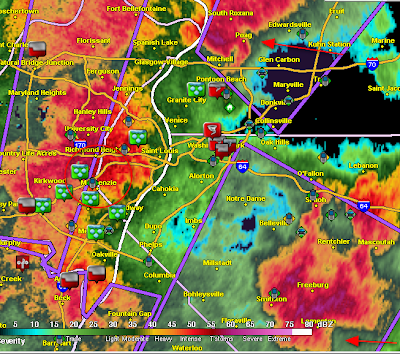 UPDATE 4:03pm: Severe thunderstorm warning for City of STL and St. Louis County. It does not include West County to the west of I-270. 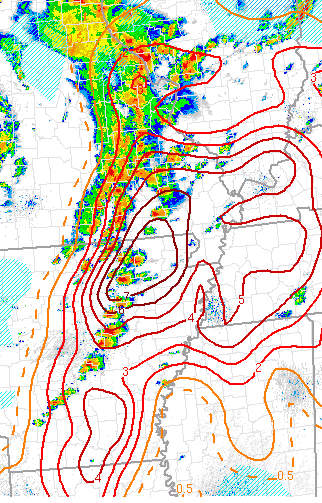 The tornado index is an extreme high value of 7 in SE Missouri and northern Arkansas. Note the line of thunderstorms in that area. 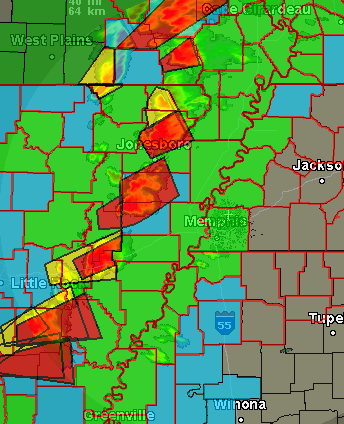 The risk of major tornadoes is extremely high! 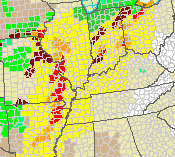 The watches touching the Mississippi River (on both sides) are "particularly dangerous situation" watches. Keep up on the weather in these areas! Sedalia, MO had a damaging tornado earlier today. 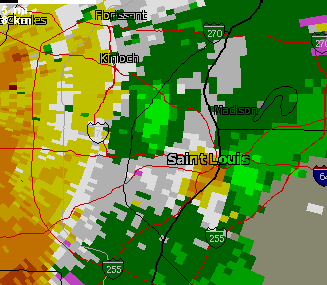 Funnel cloud, right now, near University of Missouri at St. Louis. 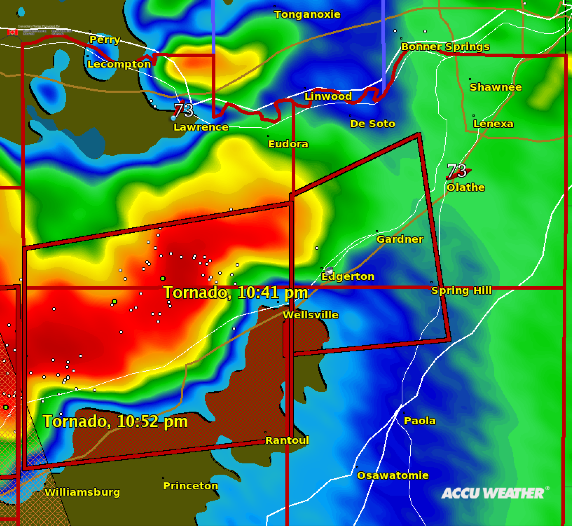 Tornado warning north St. Louis County, take cover now! Photo of funnel cloud in south Kansas City earlier today. Nick Crossley, director of emergency management and homeland security for Johnson County, said the warnings on Saturday night were necessary throughout the entire county. A personal note: I've met Nick and he is a dedicated public servant who wants to do the right thing. But, in this case, was sounding the sirens the right thing? 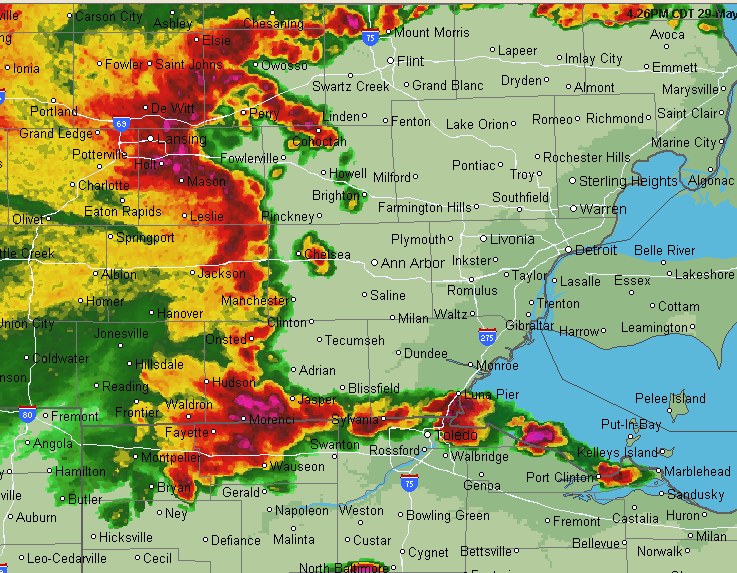 Here is the radar with the National Weather Service's tornado warning plotted in red. You'll notice only a small part (southwest) of Johnson Co. was in the tornado warning. Sounding the sirens in Edgerton, Gardner, and Spring Hill was appropriate. I'd also say to sound them in Olathe because they are right on the edge of the warning. But the rest of the county? No. It was a false alarm -- the tornado dissipated before it reached Johnson Co. I'm sure that emergency manager thought he or she was doing the right thing and erring on the side of safety, as well. Here's the problem: We are training people to ignore the sirens because of all of these false activations. The National Weather Service builds a "margin of safety" into the (relatively new, since 2005) "path-based" warnings. 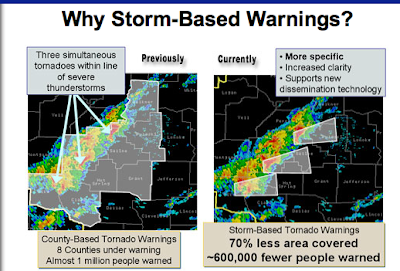 The emergency manager (who is not a meteorologist) building an additional margin of safety over and above the NWS's leads to far too many siren activations. When the sirens were pressed into tornado warning service in the 1950's and 60's, the "countywide" and "err on the side of safety" philosophy made sense because meteorology was not very good at tornado warnings. Now, meteorologists can actually predict the path of tornadoes. I believe it is time for selective siren activation to become the norm. Hook (Tornado Likely) Moving into Ottawa! An Interview With One of the "3 Chasers"